Mickey Mouse picked some flowers just for you! Charming, colorful statue stands about 8-inches tall. He might be a little shy, but his heart is in the right place. Mickey picked a beautiful bouquet of Britto-stylized flowers for Minnie… and for you! 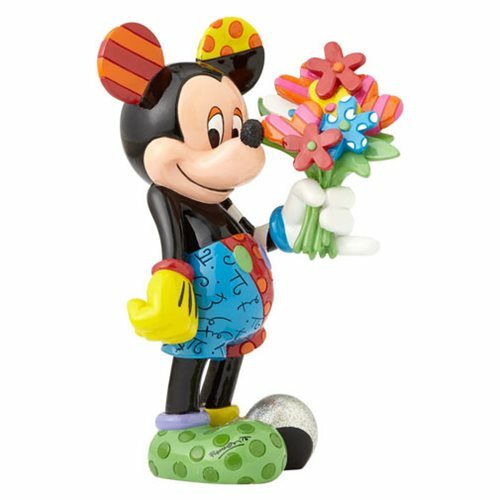 A great gift for a birthday, Valentine's Day, or just because, those close to your heart will love this Disney Mickey Mouse with Flowers Statue by Romero Britto. Designed by pop artist Romero Britto, the charming, multi-hued statue is made of stone resin and stands approximately 8-inches tall. Romero Britto is a Brazilian neo-pop artist, painter, serigrapher, and sculptor who combines elements of cubism, pop art, and graffiti painting in his work, using vibrant colors and bold patterns as a visual expression of hope and happiness. Ages 14 and up.